"One year has elapsed since C5W rents surpassed their Q3/2008 level, and 23W rents are now approaching their own high water mark," says Savills. Credit: Supplied: Savills Research licensed under . Savills Research has released their Tokyo – Q1/2019 Residential Leasing Report. Average mid-market asking rents in Tokyo’s 23 wards (23W) stood at JPY3,927 per sq m at the end of Q1/2019, up 2.7% QoQ and 3.6% YoY. Average asking rents in the central five wards (C5W) were JPY4,674 per sq m at the end of Q1/2019, up 2.6% QoQ and 3.2% YoY. The Inner North once again recorded the strongest annual growth as its proximity to the centre, coupled with a healthy discount to the C5W, attracts demand. The Inner East rents are steadily approaching the 23W average as new supply comes online. Occupancy rates remained high in Q1/2019, at 97.0% in the 23W, though small pockets of vacancy generated some volatility. 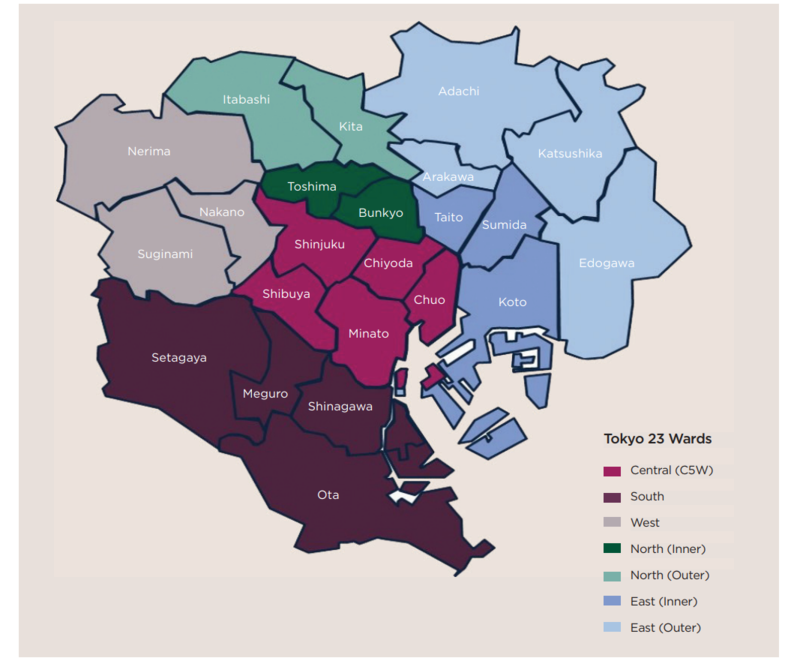 In order to illustrate trends in the central Tokyo residential market, Savills has segmented Tokyo’s 23 wards into seven distinct geographical areas: Central (or “central five wards”), South, West, North (Inner and Outer) and East (Inner and Outer). According to Savills Research smaller apartments regained their premium over larger apartments this quarter. "As net migration to the 23W is largely made up of young, single-person households, rents for smaller size band apartments should see continued growth. Even so, larger size bands should still be supported by dual-income households looking to rent rather than buy, and see their rents grow as well, albeit at a more moderate rate. Condo prices are at high levels and may steer potential owners towards the rental market, further supporting leasing demand. That being said, purchase demand could possibly shift to the second-hand market, sapping some of the potential windfall for the leasing market." Global economic uncertainty, which was particularly apparent over the last few quarters, now appears a little less severe, though certainly still present. Tokyo’s residential market is also relatively insulated from such uncertainty, with stable rent and occupancy movements. Institutional-quality assets, with a solid demand base, should manage to weather softening economic conditions. "Demand for residential assets in Tokyo is sound and increasing steadily, as net migration favours urban centres in general and Japan’s capital in particular. Furthermore, companies are continuously adding new jobs as the economy steadily grows, while wages in some industries are showing signs of growth. As such, rents should continue to rise in the 23W, and perhaps more rapidly in the C5W, where supply is tighter and demand is stronger."